The Kzin (or Kzinti, its used interchangeably) are a race of vicious but intelligent carnivores. 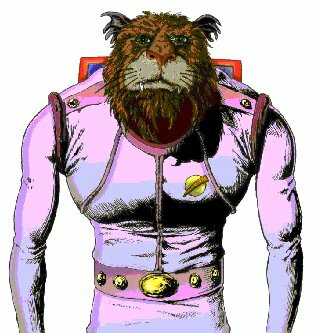 They are bipedal felinoids (cat-men) related to the Caitians, but stand about 8 feet tall compared to the generally petite, human-sized Caitians. Like the Caitians, Kzinti are orange-furred, but have a distinctly tigerish aspect as compared to the leonine Caitians. 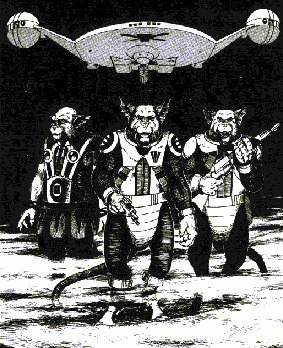 Unlike a Caitian, a Kzintis ears and tail are hairless. Most Kzinti look like large orange-furred tiger-humanoids, but that isn't an exact description. The Kzinti are physically large (usually 2.5 meters tall), and they have a preference for unarmed (natural claws and teeth) combat. They also use phasers and disruptors. Immensely powerful, Kzinti have more than one heart and vertical bracing of their ribs. Their warrior code of single combat commits them to fight to the death any foe who engages in hand-to-hand combat with one of them. If a Kzin commander is physically attacked, combat reinforcements may not be requested until honor is settled. Kzin are known for their favored attack strategy, which is "Scream and Leap" (as in just scream and leap). Kzinti only eat flesh (preferably blood-raw and served at body temperature), and refuse to speak to herbivorous beings, save when absolutely necessary. They also revile pacifists, so Vulcans are doubly contemptible to them. They will reluctantly converse with omnivores like humans, although they will use other peoples for food if possible. 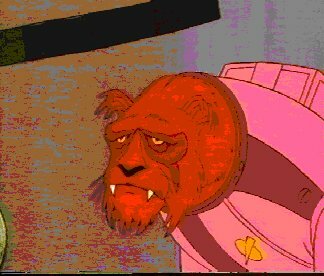 Kzinti females are non-sentient, animal-minded creatures (unlike Ferengi females who are only repressed), and fought over, kept in harems much like lion prides. Kzin males frequently forget that females of other species are usually sentient beings. This leads many of them to underestimate female opponents, because they instinctively consider females to be inferior. They are very touchy about their honor and have no respect for vegetarian (herbivore) races (whom they consider prey). The Kzinti and Lyrans, though both feline, hate each other. The Caitains and the Kzinti also do not get along too well, though they are on better relations than the Lyrans. The Kzin produce telepaths with great ability to read minds, but these individuals tend to be unhappy neurotics. Although they do not need to touch a subject to read its mind, they are reluctant to read omnivore minds, and will only read herbivore or female minds if disciplined by the commander. Reading minds causes great psychological stress to telepaths, and unless the telepath rests for a period of time after each mind reading, the stresses build up and they tend to lose consciousness. Thus, Kzinti commanders do not use their telepathic subordinates casually. Every police ship has one telepath aboard, and 15-25% of other Kzinti ships have one on board as well. Among the Kzin, names are given only to individuals who have been awarded that honor by the Patriarch, the ruler of all the Kzin. This practice is similar to the British monarch awarding knighthood to worthy individuals. Unnamed Kzin are referred to only by their rank or specialty  i.e., Captain, Flyer (starship pilot), Telepath, and so forth. Distinguished Kzin gain a partial name (i.e., Chuft Captain, Jarl Captain are examples of typical partial names). Only the greatest of Kzinti warriors gain a full name, which is unrelated to their partial or rank/specialty names. Around the time that the Romulans and Federation were fighting their first war, the Klingons and Kzinti met each other in their first war. Both sides consider the other to be evil barbarians. Kzinti, while being honorable by their own standards, tend to consider other races to be inferior to them, and consider eating dead sentient beings to be acceptable (but then, Klingons have odd diets at times as well). Though they fought for many years, there was no successful end to the war. Eventually, the Kzinti met the Federation, and attempted to conquer them. It didn't work, but the Federation tended to treat Kzinti prisoners well, and though other wars occurred, they eventually became friendly. Though this friendship was always limited; even when the Klingons were advancing on Kzin (the name of the Kzinti home-world), the Kzinti maintained a large fleet on the Federation border. The Kzinti have fought four wars against humanity, losing all of them. This has been due in large part to inferior technology and a tendency to attack before they are ready. Kzinti technology development has been slowed by their distrust of pseudo-intelligent computers; the Kzin have ancient legends of weapons haunted by dead owners, and thus are reluctant to deal with machinery that talks. 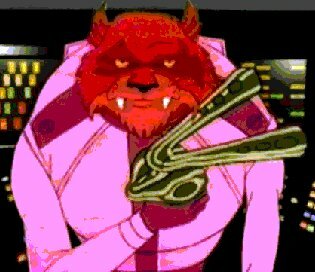 After the last war, The Federation and the Kzin Patriarchy signed the Treaty of Sirius, which limited the Kzin to possess weapon technology that is related to police functions: ships and police webs (a wire mesh which is spread on a flat surface, and looks like a spiders web. With the power turned on, a tractor field is activated which prevents any one standing on the web from moving his or her feet (or any other part of the body which is touch the web). They are fully portable. ), and police stunners (akin to phasers, but only capable of stun functions). Until 2292, the dozen worlds of the Kzin Patriarchy had the status of a Federation protectorate. In 2292, Kzin and Federation diplomats rescinded the Treaty of Sirius, allowing the Kzin to follow their own destiny. Within 5 years, the Kzin had all but closed their border to all non-Kzinti ships. They have no moral issues with eating other sentient beings (the prey thing again) often before such beings are rendered non-sentient. They host barbeques for their prisoners, who are the center of attention (and usually the main course as well). In terms of design, old-style Kzinti ships have more missiles than Klingons, similar or fewer disruptors, and a mix of phaser 1 and 3 (no phaser 2). They are relatively underpowered designs, but since missiles don't need power and phaser 3 are very efficient, they don't need as much power. Current Kzinti ships, while they are designed in the same way as the old style, in terms of aesthetics, posses modern warp drives that are generally similar to a Federation Galaxy-class starship in engine design. A typical Hunter-class Police ships maximum warp is 9.93. They tend to possess Klingon or Romulan style disruptors, and are also capable of launching photon torpedoes. Recent reports also mention that Kzin ships now possess cloaking technology, though how or where they got it from still remains a mystery. Typical names of Kzinti ships are: Traitors Claw," "Hot Needle of Inquiry," Cat Who Sleeps With Dogs, Cat Who Sees Stars, Cat Who Feels Your Pain, and Blackheart Seeker are to name a few. Because of their previous status as a Federation Protectorate, the Kzinti have adopted some things from Starfleet, and changed it to suit their needs. Below is a listing of the Kzin Military/Police Command Structure, and their Starfleet Counterparts. The Patriarch, Ruler of all Kzin, ranks above even the highest War Admiral. Not all Kzin who have a rank have a full name. The Kzinti pip graphics on this page where created by Brian Minosh for the Bravo Fleet PBEM. Please do not copy these images. If you wish to obtain a copy simply email Brian at bminosh@bravofleet.com and hell be more than happily to talk to you about them. The backgrounds to the Kzinti pips and the Federation pips on this page where created by Steven Marriott, for the Tango Fleet PBE-RPG. Please do not copy these images. If you wish to obtain a copy simply go to the Tango Fleet Website, and the Ranks Page. Here you will find info regarding the Pips. Steven will happily pass along the files freely to anyone who takes the time to ask him for their use.